The five species you could select from for this year were the Brant, Northern Shoveler, Ruddy Duck, Canada Goose and Greater White Fronted Goose…As you can see, I selected the White Fronted Goose. Of this group I thought that the White Front would have been the least depicted by wildlife artists. 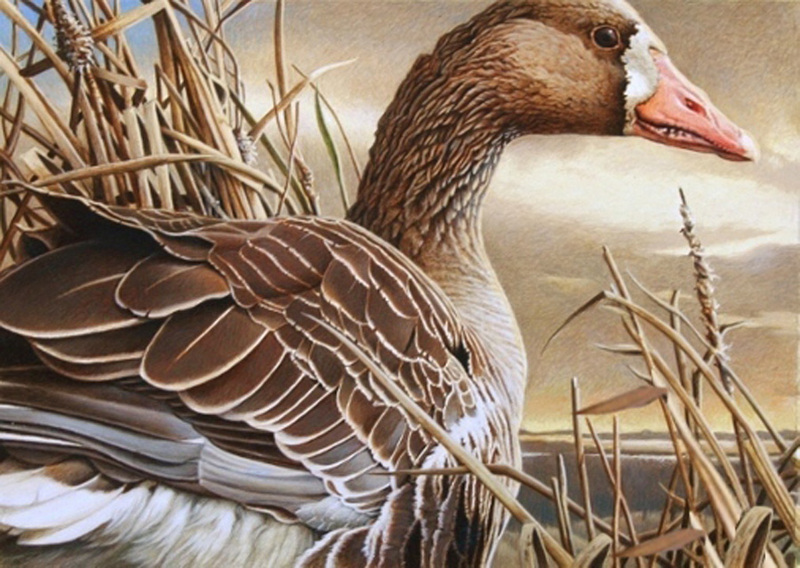 The Greater White-fronted Goose, also known as a “Speckle Belly” is a medium sized goose with dark-brown body. It’s under parts are barred and flecked with black (thus the “Speckle Belly” nickname) the remainder of the belly and under tail coverts are conspicuously white. Front of face has a white patch, normally edged in darker tones. The bill is usually pink with some hints of orange. Legs are orange. It’s a strong flier with steady rapid wing beats. As with most geese, it flies in a “V” formation. White fronts will summer on the Arctic tundra. Their winters will find them in California, Washington, Oregon, New Mexico, and Arizona, as well as near the U.S. Gulf Coast and Mexico. They tend to follow established routes and use the same stopover points each season. They are generally only found west of the Mississippi River.